The term living stones seems to be a paradox? How can a stone be alive, you might ask? Lithops, a variety of succulent from South Africa, has the common name living stone. This interesting succulent has a shape that resembles a cloven hoof, and it looks right at home in any rocky or sandy garden setting. You will find them in garden centers and big box stores in their garden area year round. They make a wonderful indoor plant. The plant has many common names – flowering stones, pebble plants, mimicry plants and of course, the most commonly used one – Living Stones. 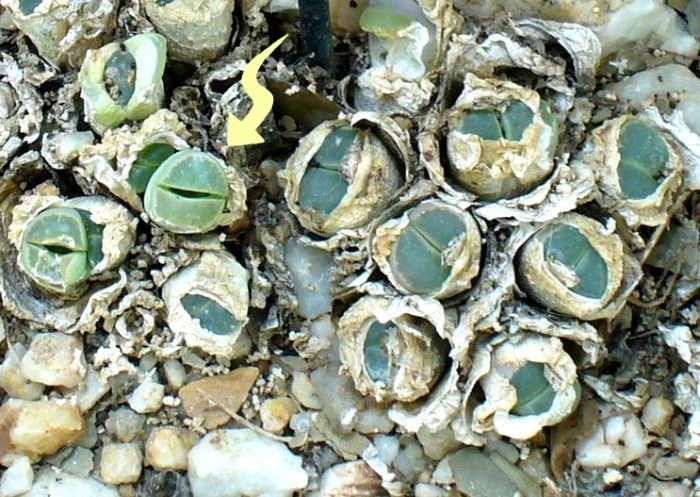 Lithops were discovered in the early 1811 by John Burcell on a trip to South Africa. 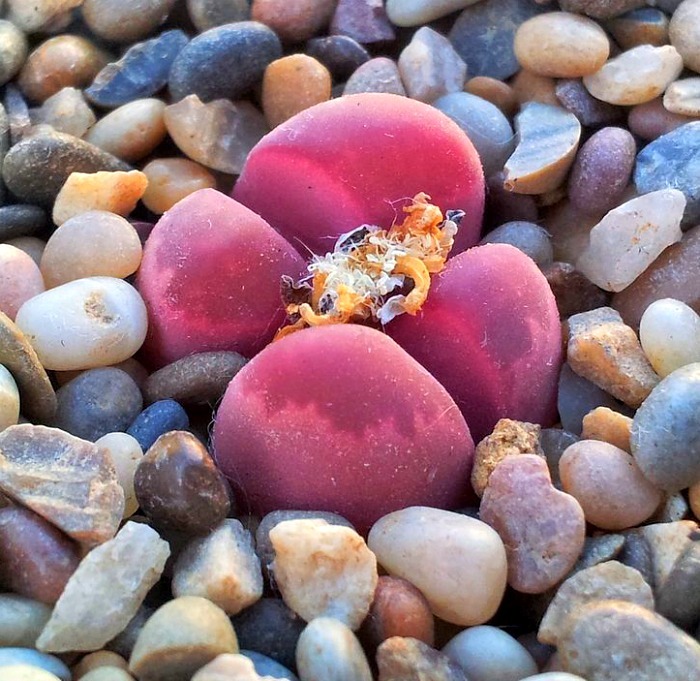 He picked up what he thought was an oddly shaped pebble and discovered that it was actually a living plant. interestingly, lithops are know in South Africa by hoof names, rather than stone monikers. There, they are called beeskloutjie – cattle hoof, skaappootjie – sheep hoof, and perdeklou – horse’s hoof, because of their similarity to cloven hooves. Lithops are very popular with collectors of succulents plants. These plants tend to the small side, rarely growing more than an inch about the soil. They will spread outward though, often forming clusters of the stone like formations. The width of each plant can be 1-3″. Since they are so small, they make ideal indoor plants. They live for a long time – up to 50 years!. It is possible for the plant to live in one pot for 10-20 years which makes them very easy to care for. 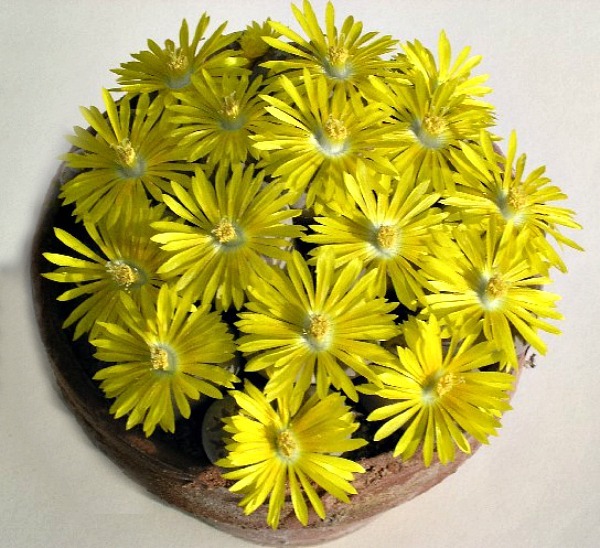 The flowers of most Lithops appear in the late fall and early winter. Flowers are daisy like in orange, yellow and white shades with many petals. The flowers will open in on sunny days and then close later in the day, like a shamrock does. Flowers appear in the fissure between the leaves. Some are lightly scented. The flowers range from 1/2″ to 1 1/2″. 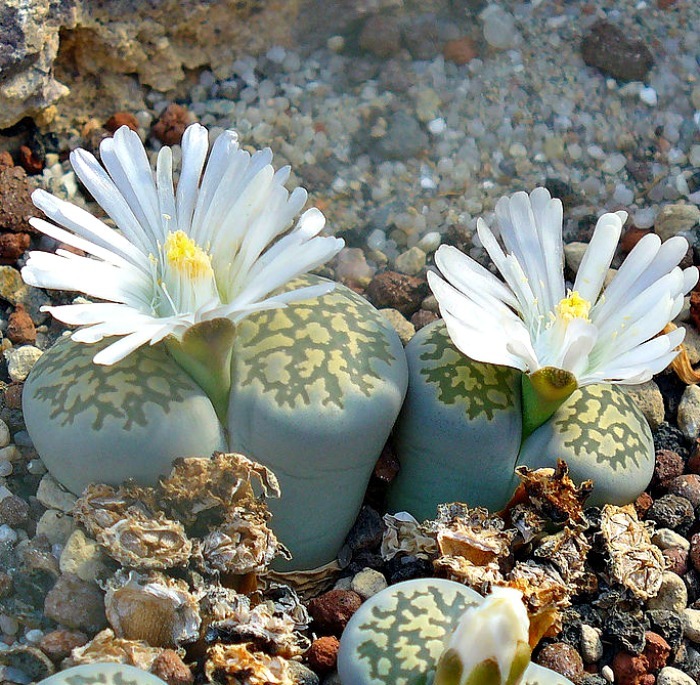 If you have a cluster of living stones, the flower formation can cover the whole plant, hiding the small living stone beneath them as this Lithops Dorotheae in flower shows.. There is no actual stem in this plant. The fissure a the top of the plant is actually a division between two leaves, which look more like lobes. The root of the plant joins directly to the leaves above the soil area. 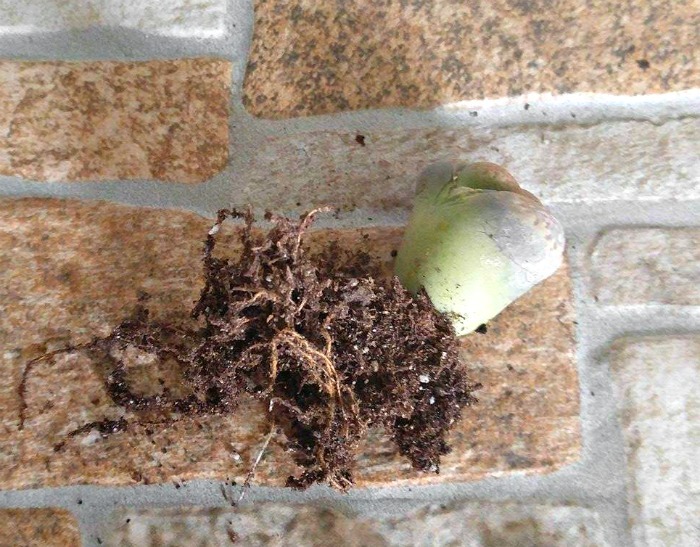 The root system is large compared to the plant, so grow them in a 3-5 inch pot. Well draining soil is a must. The plant does when when grown in cactus soil. 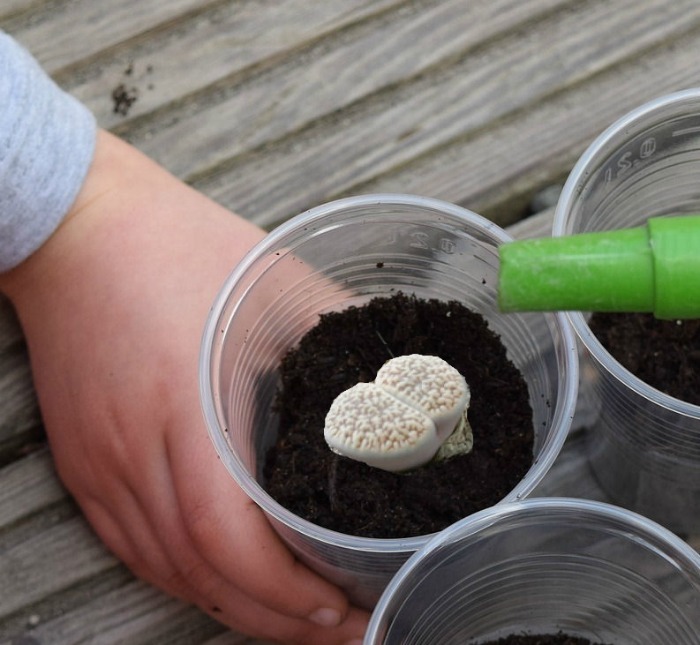 Adding sand, perlite or other gritty material to normal potting soil helps drainage. too. Plant so that the leaf lobes sit just slightly above the soil level. I like to add gravel to my plants as top dressing for a natural look. Lithops are able to survive in very dry areas. They have a capacity to store water. Almost the entire plant is devoted to just this function. In the wild, the thick leaves of the plant can store water for months without rain. When there is a drought, they will shrivel and shrink below the soil level. It is important to remember this. The most common problem with caring for lithops is over-watering. Too little water will give you stunted plants, though. Let the plant dry out completely between waterings for best success. Lithops need sunlight to keep growing. They like bright light. Since they are very small and have a large portion of the plant underground, getting sufficient light can present a problem. The answer comes from the “leaves” of the plant. The wide leaf tips of the plant have windowed cells that allow the light to get to the inner portion of the leaf. Since the majority of the plant is underground, this helps with light penetration. Indoors, they like 4 or 5 hours of direct sunlight in the early part of the day, and partial shade in the afternoon. A sunny south or east facing window sill is ideal. You will know if it is not getting enough sunlight. It will start to elongate as it reaches for the sun. If this happens, move it to a more sunny location. 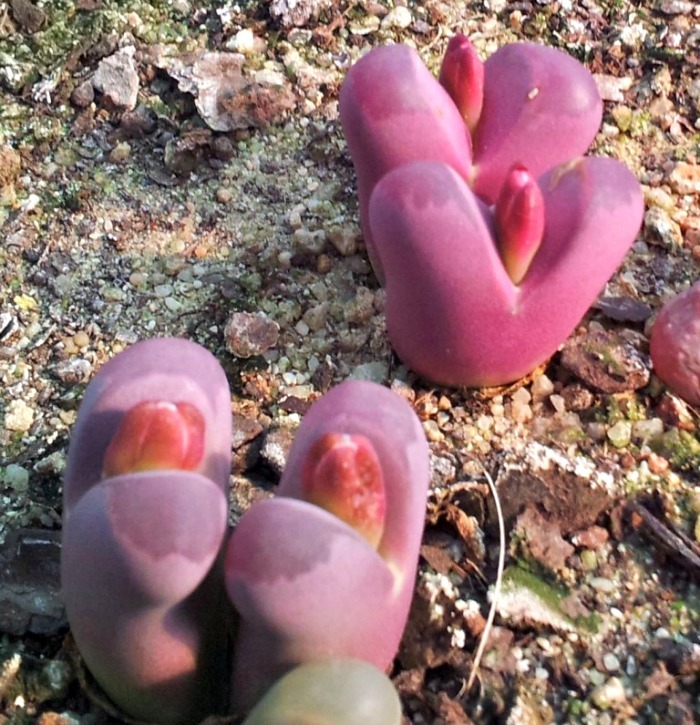 The Lithops Optica Rubra in the photo above is about to flower but also has an elongated body. It needs a bit more sunlight. 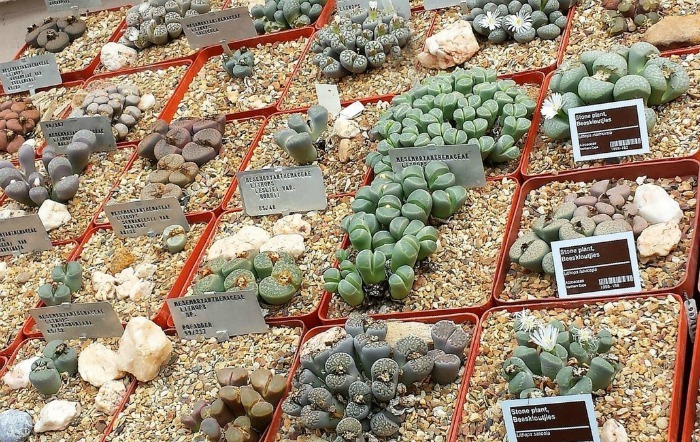 There are several dozen species and over 100 varieties of Lithops, all having a similar look from one to the other. The differences come from the markings, colors and textures of the body of the plant. Lithops is only cold hardy in the very hottest of zones. In colder climates, grow them in pots and bring them indoors over the winter months. Never allow them to freeze, since the leaves are basically a water reservoir for the plant. Propagation comes from division of existing plants or from seed. Division is the easiest method. Growing Lithops from seed can take many months to get them established, and years before they resemble the parent plant. 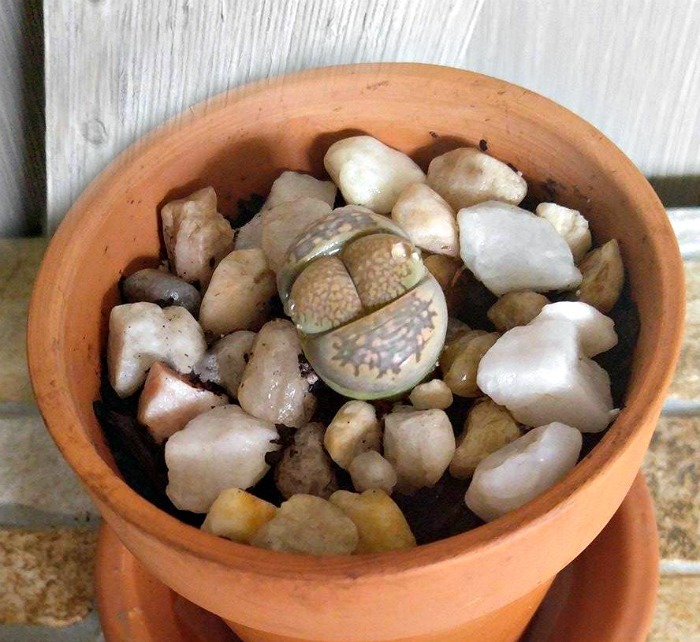 Lithops seeds are available on the internet or from succulent nurseries. In the photo below, the older leaves are shriveling away and new leaves are growing. The two on the left side are forming two plants. These could be divided. Lithops need very little fertilizer. 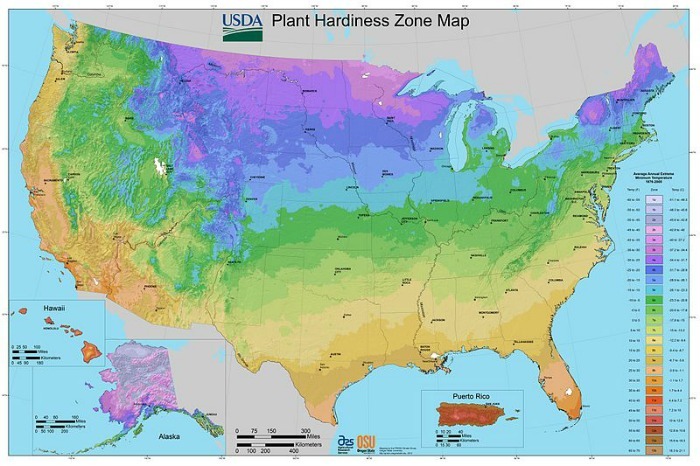 If you do add it, use a low nitrogen, high potassium variety of fertilizer. 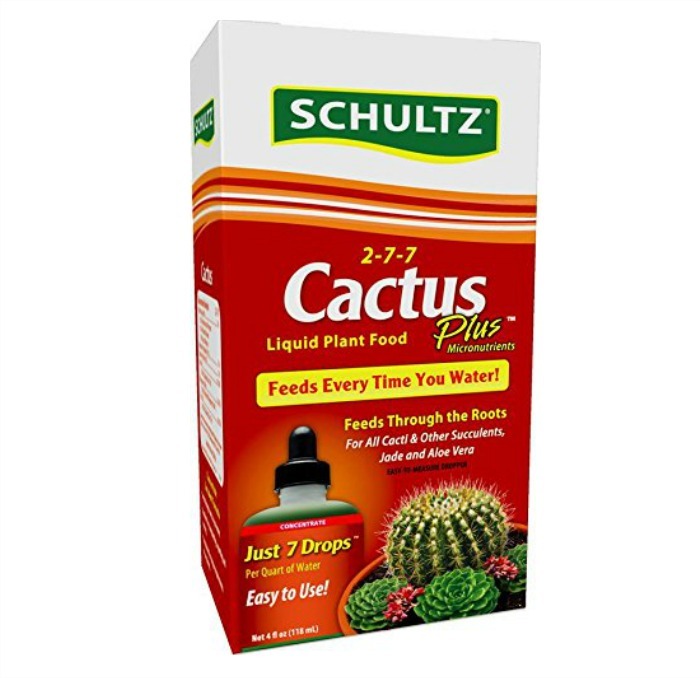 To encourage flowering, a diluted cactus fertilizer can be added in spring when you commence watering afer the dormant period. Once the plant has flowered, it will go into a period of dormancy. At this time, a new body will develop. A new body will grow out between the fissure in the leaves. The old leaves will wither away and more than one leaf pair may grow. If this happens, once they are established, they can be divided, making sure each body has some roots. Withhold water during the dormancy period. 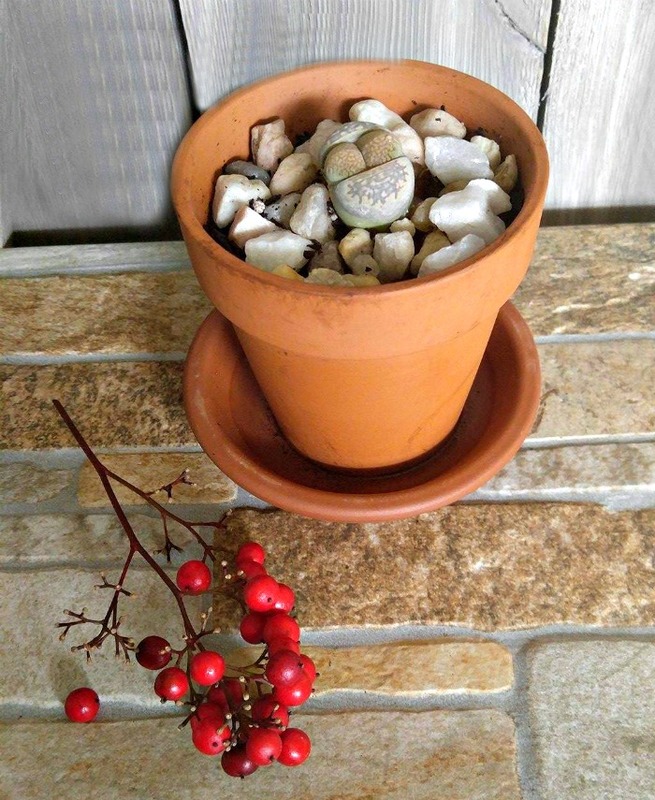 Lithops are easy to grow, unusual and look great in dish gardens. They are resistant to most plant pests. Over-watering is the common problem. Go lightly with the watering can, give them sufficient light, and enjoy this unusual plant for years to come. Very interesting plants. Will try to get some because I like them. Never seen them before but keen to have one of them. Thanks for the information.